Southwest Parks & Minnehaha Parkway Regional Trail Master Plans: Madeline Hudek from the Minneapolis Park and Recreation Board and Mike Jischke who volunteers on the Minnehaha Parkway Regional Trail Citizen Advisory Committee attended to give an update on the new Initial Concept Designs for each park space in SW Minneapolis and along Minnehaha Parkway. Residents asked questions and voiced concerns around the proposed smaller parking lot at Armatage Park, changes around more soccer and fewer baseball/softball fields, real vs. artifical turf, and the lack of a walkable neighborhood dog park. (See the designs and how to weigh in on both plans here). The board edited and approved its 2018 Annual Report for the City of Minneapolis. Neighborhoods 2020: the City recently released a draft framework that would change how neighborhood organizations like the ANA are governed and funded. Funding changes are likely and that could have a big impact on the programs, events, and services the ANA offers. The board discussed the proposed changes outlined in the framework, the recent Neighborhoods 2020 workshop at the Community Connections Conference on February 2, how to weigh in, and strategies to engage residents in the process. The ANA plans to launch a new Mini Grant program this spring. The board discussed the proposed guidelines and application drafted by the Mini Grant Committee, made edits, and voted to approve proceeding with the program. The board will vote on Mini Grant initial funding at its March 19 meeting. The Green Team met on February 6 and discussed zero waste at the upcoming summer festival, the upcoming 2019 rain garden project and reserving a few rain garden slots for renters (with property owner approval), offering additional grants for rain garden applicants who meet income guidelines and the upcoming Fix-it Clinic on March 9. Email anacoordinator@armatage.org to get involved. This is a friendly reminder that parking is banned on the even side of non-snow-emergency routes until April 1 or until our huge snowbanks melt enough that the City can lift parking restrictions sooner. Let’s cross our fingers for that happening before April 1. See all the details including instructions on downloading a snow emergency/winter parking app for your phone at http://www.ci.minneapolis.mn.us/snow/. Want to keep the Summer Festival, Halloween at the Park, Happy Hours, rain gardens, Fire on Ice, forums on pressing community issues, or security rebates? These and more are all services provided and supported by the Armatage Neighborhood Association. Funding for neighborhood groups like ANA and the events we support runs out next year. Leave text message or voicemail: (612) 440-5762. In person: Attend a public comment session. Please cc the ANA at anacoordinator@armatage.org and Council Member Linea Palmisano at linea.palmisano@minneapolismn.gov on your comment. Thanks for making your voice heard. We’re a little over a week out from the upcoming Fix-it Clinic on Saturday, March 9 from 12:00pm – 4:00pm at the Armatage Recreation Center (2500 West 57th Street). 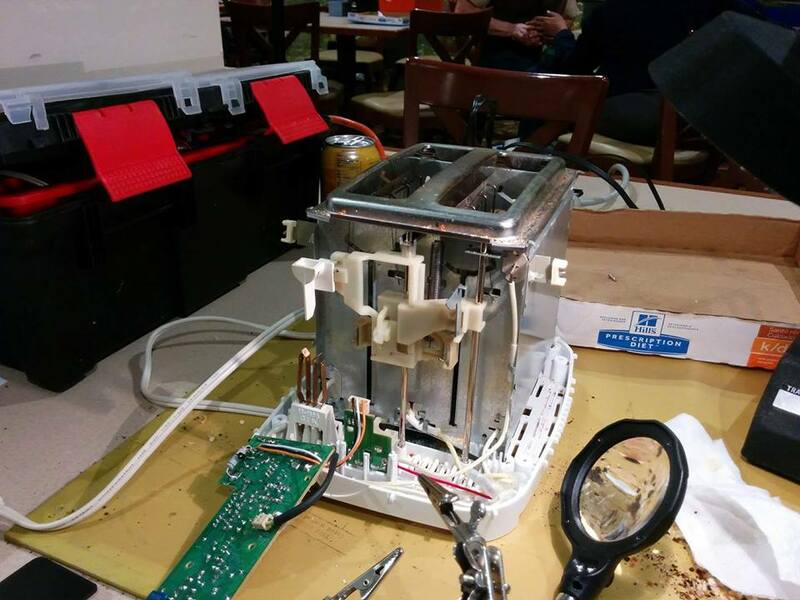 Fix-it Clinics allow anyone to bring in broken small household appliances, clothing, electronics, mobile devices and more and receive free guided assistance from knowledgeable volunteers with repair skills to disassemble, troubleshoot and fix your items. Fix-It Clinics teach valuable troubleshooting and basic repair skills, build community connections, and reduce the number of repairable items that are thrown in the trash. For more information, visit http://www.hennepin.us/fixitclinic or contact program coordinator Nancy Lo at nancy.lo@hennepin.us or 612-348-9195. 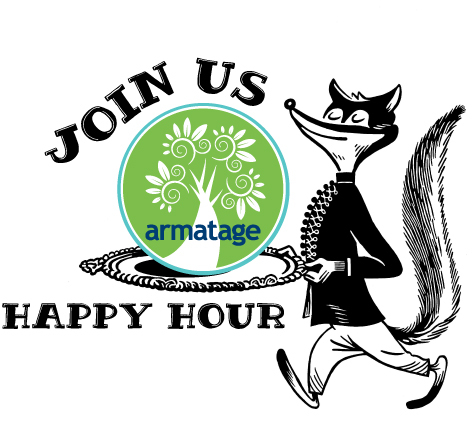 Join your neighbors for free pizza and conversation at our second Neighborhood Happy Hour of 2019! There is so much happening at the City, with our parks, and throughout Armatage. This is a great, informal chance to meet neighbors, talk with current board members, and hear all about what’s going on in the neighborhood. A friendly reminder that pizza is free, drinks are extra, and help tipping our servers is always appreciated. Initial Concept Designs are out for each Southwest Minneapolis park and for the Minnehaha Parkway Regional Trail. 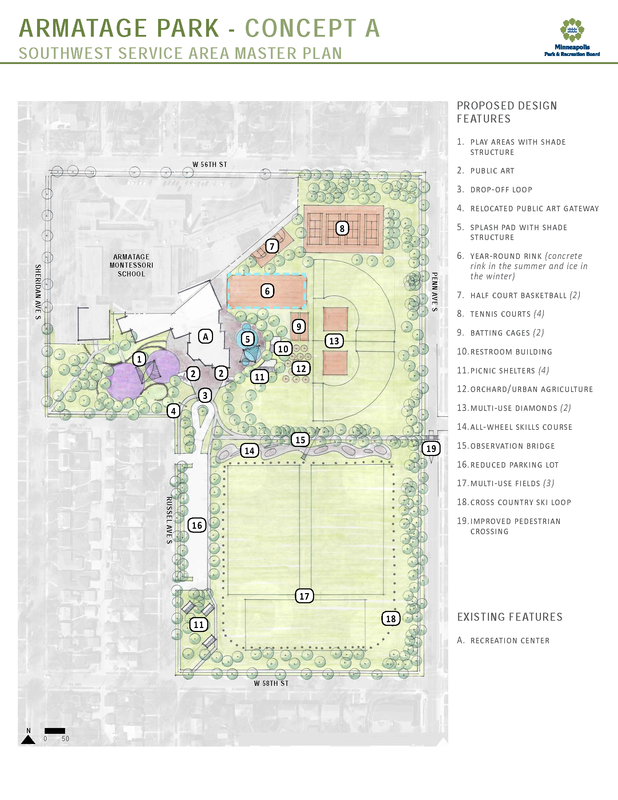 We’ve posted the design options for Armatage Park, the Washburn Tot Lot, the 58th & Oliver Triangle and Minnehaha Parkway on the ANA website at https://armatage.org/southwest-park-plan-initial-concept-designs/ All Southwest park designs are searchable at minneapolisparks.org/sw and full Minnehaha Parkway designs are at minneapolisparks.org/minnehahacreek. Drop off a comment: All 13 Southwest Minneapolis Recreation Centers as well as MPRB Headquarters and Parade Ice Arena have a printed packet of concept designs, along with comment cards and drop-off boxes. This entry was posted in Green Living, Meeting Highlights, Minnehaha Creek, Park, Snow Emergency, Transportation on April 4, 2019 by anacoordinator.